There seem to be four inevitable things about Madison, South Dakota: The winters are cold, the summers are hot, the wind never ceases, and the Bulldogs always field a losing basketball team. Lance Masterson, who is known to his peers by the nickname of Bambi, can't do anything about the weather, but he decides he can do something about the basketball program. Though only an eighth grader, he drafts a document dubbed The Bulldog Compact in which the signers pledge to give do everything they can to win the state basketball championship. The mission they chose to accept is to train their bodies, minds, and spirits to make a heroic attempt at conquering the summit of South Dakota basketball. Bambi and his friends come of age as they find it is easier to sign on the dotted line than to pour out the blood, sweat, and tears needed to reach their goal. They discover that not only do they have to overcome the bigger schools of the class A ranks but also have to battle themselves and the naysayers of their own community in order to hang onto their dream. Blessed with the vigor of youth, the hubris of adolescence, and the naivete of small town America, Lance "Bambi" Masterson, in author Donald James Parker's novel, The Bulldog Compact, tackles a challenge greater than the influences that would bind him to indifference. Compelled by frustration and pride, guided by historical precedence, supported by a loving family and close friends, young Masterson plunges head first into the turbulent waters of accomplishment. Intent on determining his own role in an heartland high school community, he embraces the ultimate challenge while deciphering the world around him. In the course of singular dedication, Bambi encounters the reluctance of peers to accept a wholesome, purpose driven life while confronting his own capering demons. Assistance from an unlikely source sets the stage for Don Parker's next book in his Masterson family series: More Than Dust in the Wind. The Bulldog Compact rewards readers with a cast of entertaining and probable characters; a coming of age story realistically presented. On-the-court flourish, sensitive interaction, insight into the mechanisms of determination; and the pitfalls of obsession, contribute to this poignant tale of one young man's struggle to realize his dream. "The Bulldog Compact" is a book I highly recommend. Once I started reading it, I didn't want to put it down. A young 8th grade boy has a dream of winning the state high school basketball championship someday ( a feat previous teams from his high school had never done.) As an 8th grader he gets a group of young men together to put forth a compact to help accomplish their goal. As the years go by there are many challenges to their compact both from their peers and from themselves. Do they accomplish the goal? You will have to read the book to find the answer. In addition to being well written and captivating, I found the book to be very motivational and inspirational. An inspiring book for people of all ages. Mr. Parker did a nice job! Traditions are normally looked upon as good things, particularly if they’ve been around for an extended period of time. In Madison, South Dakota, though, there’s one particular tradition that the local folks would love to forget: that of their high school basketball team’s losing ways. Try as they might, the men’s basketball team can’t escape the doldrums of defeat year after year, and this somber legacy has upset no one more than Lance “Bambi” Masterson, member of the local junior high’s basketball team and proud supporter of his local community. Fed up with seeing his town’s team being laughed off the court time and again, Bambi resolves to put some skin in the game and exhorts his teammates to join him in “The Bulldog Compact,” a uniform declaration in which all the boys agree to do whatever it takes to win a state basketball championship before they graduate from high school. No good deed goes unpunished, though, and, despite their noble intentions, the boys soon find themselves beset on all sides by various external distractions – and they even find it more challenging than they previously thought to realize their ultimate goal. Along the way, hearts are broken, allegiances tested, and many a lesson is learned as the boys mature into young men – a process that’s challenging enough on its own. Throughout it all, though, Bambi grows into a strong, spiritually sound individual who, once he embraces the full spectrum of his true power – becomes quite an impressive young man with an infinitely fruitful future ahead of him. The initial installment of the Masterson Family Series, The Bulldog Compact introduces the reader to a host of compelling characters, chief among them Bambi, the fearless protagonist, and Lisa, the intriguing apple of his eye. In his debut tale, Donald James Parker bestows upon his assorted cast the challenging task of displaying for the reader the various difficulties and ultimate rewards of living a life of discipline and dedication. Naturally, the road is not always smooth, but, with the end goal in mind, the challenges that present themselves are never permanent roadblocks especially if we learn to rely on a strength greater than our own. Bambi does just that, allowing the reader to realize the value of adopting his/her own personal faith and fostering its ultimate growth and development. 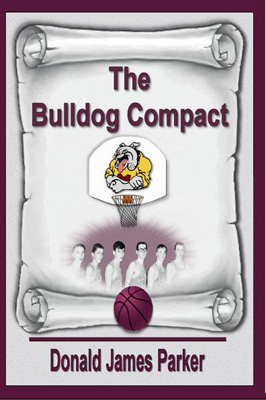 A heart-warming tale of victory through perseverance, The Bulldog Compact is quite the enjoyable read.